If you use an integrated Windows GNSS sensor, you do not need to perform any additional configuration steps or driver installations. Simply click Settings => GPS Settings to verify that your sensor is working and providing data on your current coordinates. 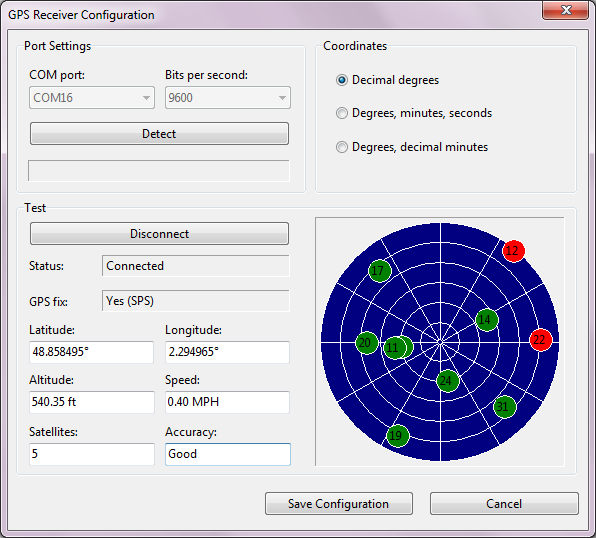 If you use an external GPS receiver, connect it to your laptop and configure it as per the manual provided by the device manufacturer. For Bluetooth devices, this typically involves “Bluetooth pairing”; and for USB devices, a driver installation is usually needed. Once your device has been connected to your laptop and turned on, click Settings => GPS Settings. 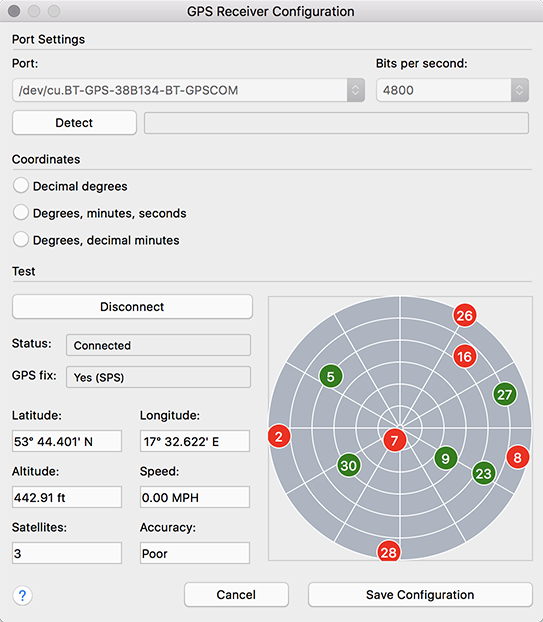 To configure TamoGraph to use your GPS receiver, all you need to know is the COM port number (on Windows) or Port name (on macOS) through which your device is connected to your computer and the Bits per second rate. The Port Settings frame allows you to select these values. Finding out the port number is discussed below in this chapter. The Bits per second rate is typically 4800 or 9600; please refer to the GPS receiver manual to find out this value. You can also click Detect to have TamoGraph scan your ports and detect the correct values. However, this might take several minutes. Once you have selected or detected the port number/name and data rate values, click Connect to test your GPS receiver. The dialog will display the connection Status and the availability of GPS data (also referred to as a “GPS fix”). If GPS data is available, which typically requires that you be outdoors, you will see your current Coordinates (you can select the format you prefer in the corresponding frame), as well as the data accuracy information. Click Save Configuration to save the data. You are now ready to perform GPS-assisted site surveys.